Sister M. Colman was called by God just after midnight on Saturday morning 26 May. She was 94 and had been waiting rather impatiently for her final call for months – even years. Born on 9 August 1923, Marie Lorraine was the oldest child of her parents, Joseph and Dorothy (Nell) Coleman of Island Bay, Wellington. The younger of her two sisters, Nanette, passed away at the age of 6 from a brain tumour. Her father worked as an administrator for NZ Railways, and the family transferred to Auckland in 1937. Sister was to spend most of her years in this city which she loved. After leaving school Lorraine completed her nursing training in 1946 at the Mater Hospital in Auckland. She had the distinction of being the first Mater trained nurse to achieve double honours in medicine and nursing. Marie Lorraine Coleman became a novice at Heretaunga in 1948, receiving the religious name of an Irish saint, Colman. She was thus able to be called by her family name (even if the spelling was without an “e”). She often spoke of her pleasure when her classmate in the nursing school also joined her at the novitiate and became Sr M. Prisca. Back to warmer climes in 1955 to the recently established St Anne’s Hostel for Maori girls from country areas. Sr M. Colman’s relationship with the girls was always warm yet fair. She was a practical, matter of fact person with a great sense of humour. With the Maori Affairs and other government departments her diplomacy and perseverance achieved results. Requests for rooms at the hostel grew. Supported by family, many benefactors and some government grants, she raised money for the extensions built in 1966. By 1970 the debt was paid. One well-known member of her family, Aunt Nellie, had the privilege of having a storage unit named after her. Many smsm kept suitcases and boxes stored in “Auntie Nellie’s”, along with furniture from Auntie Nellie and elsewhere. In the 1960s many smsm came to Auckland for professional studies. Thanks to Sister’s contacts the congregation bought a small beach house at Huia. For over 50 years this place was a blessing for many of us. After a break in 1978 for LTSR in Lexington, USA, Sister was back into this missionary work again. At Sister’s funeral many Samoans paid tribute to this woman who worked tirelessly for almost 30 years to ensure families got homes, mortgages, and whatever else was needed. She became a mentor: managing budgets and bank accounts, enrolling children at schools and for medical services. She was known as Grandma Colman or Auntie. People loved her cheerful, kind and generous nature. And she in turn loved the families she came to know, and the work she did in this community. For her the basic purpose of the work was “to be present and available to the people, to listen with open mind and heart, to try to interpret the needs the people felt but did not know how to express.” One time she admitted that some agencies tried to avoid her if they saw her coming. For 3 brief years from 1982 Sr M. Colman moved to Rotorua to open an smsm community where sisters suffering from arthritis and rheumatism could avail of the thermal and other treatments available there. Back in Auckland she lived in several different communities, continuing her connection with the Samoan people. A fall necessitated a move to Marian Rest Home in Mission Bay until yet another fall and hospitalization required greater care. 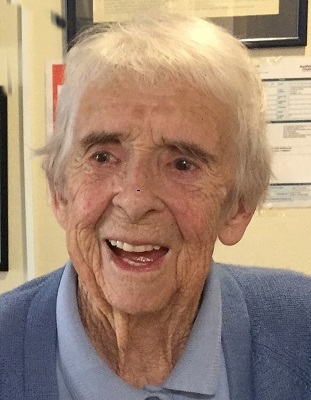 Sr M. Colman moved into Caughey Preston Rest Home in 2010, to be joined by her sister Joan, who died later that year. Always the attentive nurse, Sister chose to be in a room with three other women even when she was offered a single room. She became the voice of a bedridden resident who could no longer speak. Sister enjoyed conversations with the Anglican chaplain and valued his friendship, accompanying him at times when he prayed with residents. When finally bedridden and given a single room she became more introverted, often complaining that God was taking a long time in coming for her. Caughey Preston closed in 2017, and on 15 August Sister was accepted back in Mission Bay which by then could offer hospital care. She gradually blossomed in the company and attention she received there. Nurses and caregivers loved to tease her; now they miss her witty remarks. In recent weeks Sr M. Colman became serenely peaceful; her life as a missionary completed. At her vigil on 28 May we sang to Mary the English, Samoan and Maori hymns that Sister loved and had chosen for her jubilees. Sister Mary Colman, manuia le malaga.